KIM LAWTON, correspondent: Hollywood is always on the look-out for a new box-office miracle. And it just might help to start with the bestselling book of all time. 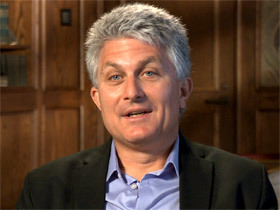 CRAIG DETWEILER, (Professor, Pepperdine University): Whenever Hollywood wants to go big, it often goes biblical. LAWTON: Ten years ago, the Passion of the Christ earned $600 million dollars and proved that biblical epics can be very lucrative. Now, new digital technologies have made it easier than ever to adapt spectacular Bible stories for the big screen. DETWEILER: The Bible is loaded with amazing source material, right? Fascinating characters, epic struggles, a big canvas, and global recognition, you know? So obviously for Hollywood looking for source material that they can get that is affordable, that’s [laugh] in the public domain, look no further than the Bible. LAWTON: But Hollywood is also well aware of the potential pitfalls, not least of which is that people usually know how the story ends. EDWARD BLUM (Professor, San Diego State University) People don’t just know the story, many of them have really strong feelings about the story. LAWTON: And therefore, says San Diego State University History Professor Edward Blum, audiences can feel a vested interest in how the story is presented. BLUM: The stakes are so high. We’re not just talking about a character. We’re talking about sacred characters and we’re talking about sacred stories, and so it’s not just Noah on screen talking to some powerful force, it’s Noah talking to God. LAWTON: The first two biblical epics of 2014 took vastly different approaches. DETWEILER: With Son of God you see something that is maybe tailored specifically towards religious audiences and says, “This is a, a film that you will feel comfortable with, that affirms your faith and your understanding.” With Noah you have a more fanciful approach, to the Bible, that’s almost more like a graphic novel. LAWTON: Noah is banking on the appeal of A-list actors, including Russell Crowe, Emma Watson, Jennifer Connelly and Anthony Hopkins. 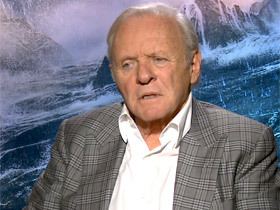 ANTHONY HOPKINS (Actor): I think the film is a great epic depicting the struggles of the human being with all his conflicts, his or her conflicts, in a vast and incomprehensible universe. LAWTON: The Noah story in the Book of Genesis is short and doesn’t give a lot of details. Director and co-writer Darren Aronofsky, who is known for dark films, filled in the blanks in many envelope-pushing ways. He included major characters not mentioned in the Noah Bible account—some non-human--and he creates key plot points not in the original story either. DARREN ARONOFSKY (Director): If you even look at what’s described in the story, it’s talking about a time before rainbows, when giant angels walked on the earth, when people lived for centuries. It’s clearly a universe that’s different than what we understand now. So to treat it as something that’s not poetic and mythical is a mistake I think. I think really what’s there is something that can inspire us. 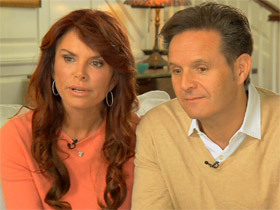 LAWTON: With Son of God, released in February, top television producer Mark Burnett and his wife, actor Roma Downey are offering a story that sticks closely to the Gospel accounts of Jesus. ROMA DOWNEY (Actor): We wanted it to look cool, we didn’t want this to be some old donkeys and sandals thing that maybe had good intention, but wasn’t well executed. LAWTON: Son of God is an expansion and re-edit of material shot for the Burnetts’ highly successful miniseries, The Bible, which ran on the History Channel last year. They say they took great care to ensure they got things right. 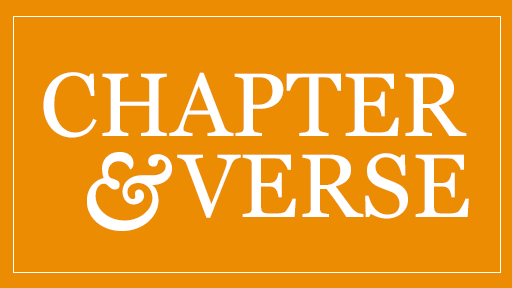 DOWNEY: We worked with academics and scholars, theologians, advisors from all denominations, to make sure that we moved forward accurately and truthfully and always in the spirit of the book. MARK BURNETT (Producer): I don’t think it’s dangerous territory. I think it’s just a matter of being respectful and within the spirit. LAWTON: But how much responsibility is required from filmmakers and artists? BLUM: Religious people want their faith to be taken seriously because they take it seriously, and they want others to consider it. But they’re not in charge. 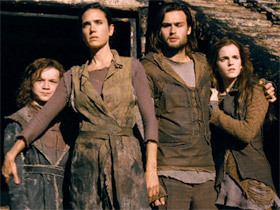 LAWTON: In Noah, Jennifer Connelly plays the main character’s wife, who is not even named in the Bible story. She says she looked to other passages about biblical women for help. JENNIFER CONNELLY (Actor): I felt a great sense of responsibility, so of course it was very important to me to always consult the Bible when making decisions. So I found some inspiration in other parts of the Bible, because there isn’t much to say about her in Genesis. I found Proverbs 31 particularly useful. LAWTON: Aronofsky says he also read widely and consulted theological advisors. ARONOFSKY: We thought about it for a really long time and tried to connect it and not contradict anything. It allowed us to have an explanation for why we represented it in that way. But I imagine there will be people who are literalists, who think that a literal interpretation can exist. But as soon as you cast Russell Crowe, you are beyond literalism. BLUM: No matter what, a film is going to alter the literary story, just by physically putting a person on screen. And whenever we alter, all of a sudden things can get messy. And so for instance, it’s not just what we put in the film, but what we leave out that might matter as well. LAWTON: How a Bible film is ultimately viewed often comes down to how people assess the intentions of the filmmakers. And with the newest round of biblical epics, the filmmakers have attempted to be very clear. BURNETT: People know that we’re Christians and know that we love the Bible. DOWNEY: We want to spread the good news. You know? LAWTON: Despite his edgy Noah interpretation, Aronofsky has repeatedly said his intention was to wrestle with the story, not disrespect it. ARONOFSKY: I think people have an idea of what it is, but I think when you look at the material it can be many things for many people and that’s what’s interesting. This is one of the oldest stories ever told and it’s connected to everyone on the planet. It’s like, it’s a treasure for everyone. LAWTON: But making a biblical epic that a broad audience can treasure is a different story. BLUM: The biblical literalist wants, “Oh, hey, does this match up with Genesis? Does this match up with Exodus?” while the more liberal modernist may want the more artistic spirit of the story but you also have another group. You have those who vigorously dislike the bible stories. And so how do you get those three groups to like the same thing? LAWTON: Following the highly successful marketing strategy around The Passion, the Burnetts have been actively reaching out to their target audience, religious conservatives. 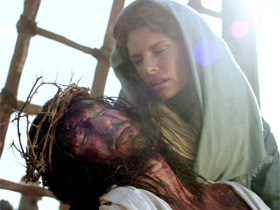 They have been waging social media campaigns, appearing at faith-based meetings, soliciting endorsements from high profile religious leaders, and encouraging churches to rent out entire theaters to show Son of God. 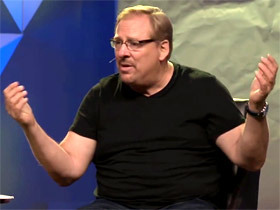 Megachurch pastor Rick Warren was among those on board. DETWEILER: I think Hollywood is slowly learning who the religious filmgoer might be and what their concerns are. It’s been a tenuous relationship. Hollywood is I think trying to do a good job and finding that the sensitivities are much higher and greater than they realized, so it’s a process of mutual education. LAWTON: And no matter the approach, many analysts say they are pleased Hollywood is generating new theological conversations about the Bible. DETWEILER: There’s some people who want their entertainment to, to be comforting. Right? And to comfort the afflicted. Other filmmakers they like to afflict the comfortable. They kind of come at you. And we have churches that do the same. How great that we’re at a point where Hollywood is sort of offering both. LAWTON: And that may be the biggest miracle of all. I’m Kim Lawton in Los Angeles.